(Nanowerk Spotlight) The long-term vision of revolutionary bottom-up nanotechnology is based on two different concepts of molecular assembly technologies. One follows Nature's blueprint, which uses molecular recognition for self-assembly of nanoscale materials and structures; the other is man-made and uses instruments to assemble nanoscale building blocs into larger structures and devices (see for instance: "Organic molecular nanotechnology"). In contrast, the most common nanoscale fabrication techniques used today, for instance in the sub 100-nanometer semiconductor industry, are top-down approaches where fabrication technologies such as lithography or stamping are used. Here, you create ever smaller structures by starting with a block of material and remove the bits and pieces you don’t want until you get the shape and size you do want. While top-down techniques can be highly parallel (semiconductor industry) it is not feasible to control single molecules with them. Using a hybrid approach that combines the precision of an atomic force microscope (AFM) with the selectivity of DNA interactions, researchers in Germany have successfully demonstrated a technique that fills the gap between top-down and bottom-up since it allows for the control of single molecules with the precision of atomic force microscopy and combines it with the selectivity of self-assembly. "In the past, great efforts have been put into creating DNA structures like the so called DNA origami or crystals composed of nanoparticles" Dr. Hermann E. Gaub tells Nanowerk. "However, these approaches exclusively rely on self-assembly and are purely bottom-up. They don't allow control over single molecules and the structures that are formed are predetermined by the design of the experiment." Gaub, head of the Biophysics and Molecular Materials Group in the Physics Department at the Ludwig-Maximilians-University (LMU) of Munich, together with Elias Puchner and colleagues from the university's Center for Nanoscience and the "Center for Integrated Protein Science Munich", combined the precision of atomic force microsccopy with the selectivity of DNA interaction to create freely programmable nanopatterns of DNA-oligomers on a surface and in aqueous environment. 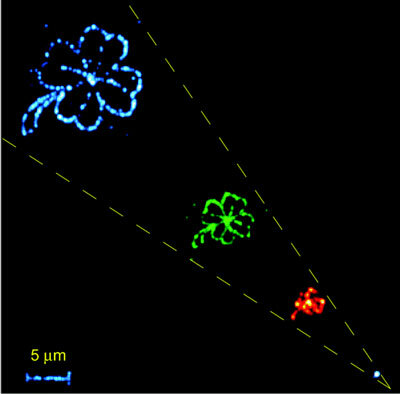 What the LMU researchers did was create a DNA scaffold by picking biotin bearing DNA oligomers with an AFM tip and depositing them, one by one, in a desired pattern on a surface, basically creating a pattern of attachment points for fluorescent semiconductor nanoparticles conjugated with streptavidin. The small bacterial protein streptavidin is commonly used for the detection of various biomolecules and it binds with high affinity to the vitamin biotin. The strong streptavidin-biotin bond can be used to attach various biomolecules to one another or onto a solid support. When the sample with the DNA scaffold is incubated with a solution of fluorescent nanoparticles, a rapid self-assembly process of these particles on the predefined scaffold takes place. The team calls this technique Single Molecule Cut-and-Paste (SMCP) technique. In a paper published in the October 1, 2008 online edition of Nano Letters they describe how they use this method to create nanoparticle superstructures ("Nanoparticle Self-Assembly on a DNA-Scaffold Written by Single-Molecule Cut-and-Paste"). They originally introduced this technique in a previous paper in Science ("Single-Molecule Cut-and-Paste Surface Assembly"). "By using DNA oligomers with biotin as a functional unit, we were able to create freely programmable patters of binding sites to which, in the next step, streptavidin conjugated nanoparticles were allowed to bind" explains Gaub. "This new approach establishes independence of the DNA-transporter system and allows, in principle, the assembly of any nanoobject that is conjugated with streptavidin in arbitrary structures. Our work therefore expands the toolbox of nano-biotechnology." Nanoparticle self-assembly guided by specific molecular interactions has in the past been very successfully used to design complex structures with novel functions promising a rich field of new applications. Gaub and his collaborators have expanded this concept by a written scaffold and demonstrated that molecule-by-molecule assembly of a binding pattern combined with the self-assembly of semiconductor nanoparticles guided by molecular interactions is a straightforward and very general means to create nanoparticle superstructures. The German scientists say that the assembly of planar nanoparticle structures of arbitrary design can easily be assembled this way. "An expansion into the third dimension appears challenging but achievable" says Gaub. "Covalent cross-linking of the DNA oligomers after hybridization can be employed to stabilize the scaffold, and multifunctionality of the nanoparticles attachment sites may be used to build subsequent layers of structures. This could lead to a new dimension of complexity and novel effects." Gaub also points out that for this study the team always used the biotin-streptavidin interaction as the coupler, and therefore only single component structures were assembled. "However, since a multitude of couplers with orthogonal affinities is available, the assembly of multicomponent structures would be straightforward" he says. This approach is not so much geared towards assembling large numbers of units rather than designing individual assemblies with tailored properties and online control of the arrangement. "Especially appealing is the assembly of active players like enzymes" says Gaub. "Synthetic biology approaches become possible now where enzymatic cascades are assembled at will. Coupling between the different enzymes is controlled by vicinity and diffusion of the products much like at the membranes of organelles. The typical distances between the constituents of natural cascades become for the first time accessible with our technique." Research at Gaub's Biophysics and Molecular Materials Group aims towards single molecule synthetic biology. The observation of single biomolecules, like enzymes, offers a detailed and very fundamental understanding of biological processes on the nanometer scale. In combination with their directed assembly, it might be possible to construct and observe networks of enzymes or signaling cascades. Notwithstanding the tremendous potential, scientists are only taking the first steps is this direction and numerous challenges have to be overcome on the way. 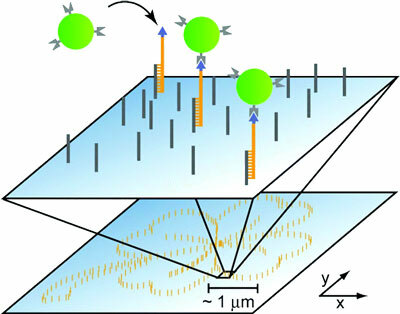 With regard to the LMU scientists' SMCP technique, further developments might include the improvement of optical resolution by combining SMCP with super-resolution techniques, the confinement of optical excitation to the zeptoliter-range by means of nano antennas, or zero-mode waveguides and biochemical strategies for the modification of enzymes.